So you’ve just had an accident. We will help you manage the situation in a few simple steps. How these steps are followed will depend on the severity of the accident, and whether there have been any injuries. Stop your vehicle (if it can still move), then switch your hazards on and check if the road and your immediate surrounds are safe. If vehicles are obstructing traffic, take as many photos as you can - from different angles - of the original accident scene, before moving any cars. UNLESS there are any injuries, in which case the vehicles must remain as is, until the authorities arrive to take charge of the situation. Check if anyone was injured. Do not provide first-aid or medical assistance unless you are qualified to do so. Assess the damage. Take photos from all angles, and close-up photos of damage to all vehicles involved. In case of injury, call the national emergency number: 112 from your mobile phone (10177 from a landline). This is a 24/7 service that operates nation-wide, and will dispatch the appropriate services to your location. The response time will vary depending on where you are (e.g. in the city vs a remote area). You are required to report the accident to the police within 24 hours. If you are not able to, due to the nature of your injuries or hospitalisation, you must do so as soon as you can, together with a detailed explanation of the delay. You must also report the accident to your insurer, even if you are not planning to submit a claim. Also make a note of any events immediately prior, during and after the accident. Was the other party talking on his/her phone? Do you believe the driver was drunk? Did one of the parties involved commit a traffic violation like going through a red traffic light or irresponsible overtaking? Record these details for reporting to the relevant authorities or your future reference. TOP TIP: Avoid frustration later down the line and rather collect all this information while you are at the accident scene. Rather have too much information than too little, to ensure that you have everything required by insurers and other authorities. Accept any liability for the accident (even if you were at fault; let the authorities handle this). Allow your vehicle to be towed by anyone other than a service provider authorised by your insurer. Have your vehicle towed until you have been given a detailed signed tow quote that also includes storage fees, if necessary. Remember - different insurance companies may have different ways of dealing with emergency and claim procedures. Contact your insurer's emergency number and ask for assistance. 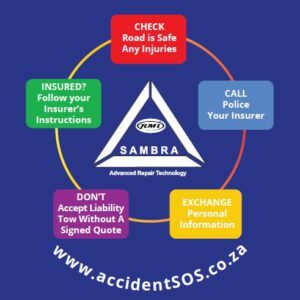 SAMBRA Accident SOS license disk stickers have been distributed to licensing departments and testing stations across South Africa. Get yours today!